“For real?” the first boy asked. “For real,” Way replied. And just like that, she knew she’d made a small, but hopefully significant, crack in their armor. Way’s work at George Jackson, which began last September, is part of a three-year program she’s spearheading called The Listening Project, being held at seven middle schools throughout New York. The goal: to counter male stereotypes by having young boys learn interviewing skills— such as asking thought-provoking questions, listening to responses, and building relationships—that will, Way hopes, make them more empathic, inquisitive, trusting, and expressive. So far, it seems to be working. In one exercise, Way even had the boys interview her, asking what-ever unfiltered questions they could come up with: Do you still love your ex-husband? Does he still love you? What does that love look like? Soon, nearly all the boys were waving their hands with questions at the ready. The cultural forces Way is pushing back against—patriarchy, toxic masculinity, traditional gender roles, bullying—are certainly nothing new. But movements like #MeToo and #TimesUp are shining a spotlight on their negative effects, not just for women, but for boys and the men they’ll become. A 2016 New York Times piece, “Teaching Men to Be Emotionally Honest,” links tough-guy stereotypes to men’s falling behind women in college and having a higher suicide rate, nearly four times that of women. A National Institute of Mental Health report, also released that year, claims that men are less likely than women to seek mental health treatment, in part because it doesn’t fit within common notions of masculinity. Marriage and family therapist Scott Sells, founder of the Parenting with Love and Limits organization in Savannah, Georgia, has been doing this with young men for more than a decade. His focus, however, is on the multigenerational aspect—the way fathers and grandfathers often place disproportionate value on physical strength, stoicism, and keeping emotions in check. “In graduate school, we’re not taught how to bring families into therapy, he says, and by relying on a single-patient model of treatment, we’re missing the boat. Bringing fathers into therapy to model expressive behavior and help sons broaden their emotional palette—what Salvador Minuchin used to call “expanding the symptom,” Sells adds—may be uncommon, but it works. Sells recently used such an approach with 14-year-old Michael and his father, Darren. Working long hours as a truck driver had made spending time with the family difficult for Darren, ultimately leading Michael’s mother to file for divorce. After the separation, Michael drew inward. When his mother or sister would try to talk with him about the divorce, he’d become angry and aggressive. After a few sessions together, Michael told Sells that he often felt confused and abandoned, but found it hard to talk about his feelings. A few sessions later, Sells held a joint session with Michael and Darren, in which he learned that Darren’s own father had been a workaholic himself and, like Darren, was seldom around to model emotional behavior beyond the aggression and stoicism learned from male peers. To help fathers like Darren expand their sons’ notions of masculinity, Sells coaches them in “emotional warm-ups,” as he calls them. Too many fathers keep an eye out for their boys’ shortcomings, Sells says. Instead, he recommends fathers draw attention to their sons’ accomplishments, not just the ones that meet society’s “masculine” standards. One creative way they can do this is by making a certificate that says they’re proud of their son for expressing himself or showing kindness—for admitting when they’re fearful or worried, for instance, or for reaching out to a lonely classmate. Don’t be afraid to get playful, Sells tells the fathers. Sneak the certificate into your son’s cereal box, or playfully write a message on a foggy bathroom mirror. For many of his young clients, Sells adds, this marks the first time they’ll have seen their fathers being emotionally expressive. 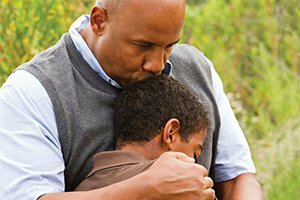 “That tiny step can make all the difference in helping boys find their own emotional language.” But don’t be surprised if you encounter a few bumps along the way, Sells says. Your son may tear up the certificate, or tense up when you hug them for the first time. This is perfectly normal, he assures the fathers. “If your young son isn’t used to this kind of behavior from you, his hug muscles are going to be out of practice. Yours will be too.” To prepare them for this, Sells and the fathers will role-play these scenarios in his office. Of prime importance, she says, is addressing the common male experience of not feeling truly known and understood, which can quickly morph into resentment, bitterness, and anger. “I can’t tell you how many times I’ve sat down with boys who nodded their heads when I asked them if they felt invisible at home, or if they felt nobody really knows who they are,” Edgette says. As part of exploring their value systems and acknowledging them, Edgette likes to ask a set of questions: Is there anybody you feel really gets you? Why do you think that is? What happens when someone gets you? Don’t be alarmed, she says, if your client doesn’t respond right away. “You’ve got an entire gender that’s unskilled in using the language of emotional expression,” she explains. But as a therapist, she’s putting these topics on the table so she and her client can return to them whenever there’s an opening. Like Sells, Edgette underscores the importance of parents or guardians in cultivating emotional fluency. She’ll ask parents how they expose their sons to experiences that allow them to find a passion and express themselves emotionally. “Too many parents tell me, ‘Well, we tried basketball and he didn’t like it. We tried soccer and hockey and lacrosse—he didn’t like those either. We’ve tried everything.’” Not only are those all sports, Edgette clarifies, but they’re all mainstream. “You didn’t try everything,” Edgette will reply. “What about archery? Go-karting? Falconry? Or, take your kid into the city. Take him to a museum. Tell him the person who finds the most exotic place to eat for lunch wins a prize.” This is the first step, Edgette says, in expanding a boy’s world beyond the physical, aggressive, and competitive one they’re most familiar with. Chris Lyford is the assistant editor at Psychotherapy Networker.